Credit card required at check-in. You must be 21 years of age to book a room at the Atticus Hotel. Please note that rates and availability are subject to change and vary by season and day. We reserve the right to change rates and amenities without notice. All rates are double occupancy and are not guaranteed until the time of reservation. We reserve the right to enter a guest room at any time without notice if we believe that property is being damaged or that illegal activities are taking place. Cancellation: Cancellation prior to 72 hours by 3:00 pm, Local Hotel Time, avoids 1 night room rate penalty. The Atticus Hotel offers Accessible rooms. Please contact our staff at hello@atticushotel.com if you need assistance selecting an accessible room. A Credit Card is required as a guarantee upon booking. We accept VISA, Master Card, Discover and American Express. You will be charged your daily room rate, plus applicable taxes and any add-on package or room service charges, on your day of departure. You will be charged for any damages to your room, including, but not limited to, broken or stained furniture or equipment; missing items; or loss of revenue due to smoking. The Atticus Hotel has minimum stay requirements during peak times. Please contact at hello@atticushotel.com with any questions about minimum stay periods. 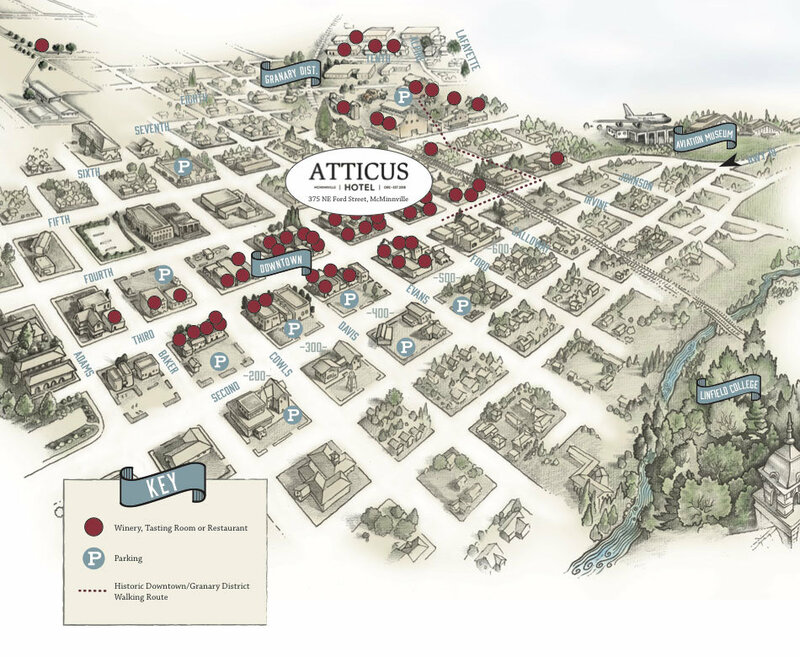 The Atticus Hotel in a non-smoking property. Any violation of this policy will result in cleaning fees equal to a minimum of one night’s stay. Small to medium Cats and Dogs are welcome at the Atticus Hotel. Aggressive breeds, dispositions or exotic animals not allowed. 50 USD per pet, per day, for up to 7 days, with a one pet limit. This fee is an additional charge. When making a reservation and staying at the Atticus Hotel, we will ask for the following: Name, Address, Credit/Debit Card number and expiration date, Billing address, Phone & Email address. This information is necessary to provide you with lodging. All information, including credit card information that you provide to us over the Internet during the reservation process, is encrypted for your protection. This encryption is designed to help prevent any unauthorized person from intercepting or reading any application information you send us. We use return email addresses to answer the email we receive. Such addresses are not used for any other purpose and are not shared with outside parties. You can voluntarily sign up for email specials online at www.atticushotel.com. We never use or share the personally identifiable information provided to us online in ways unrelated to the ones described above.